Inspired by the big snow storms that barreled through Kansas City last week, I decided to read Isaac’s Storm by Erik Larson. This one has been on my TBR for not too terribly long, but what better time to read it than holed up at home on a couple of snow days off from work! 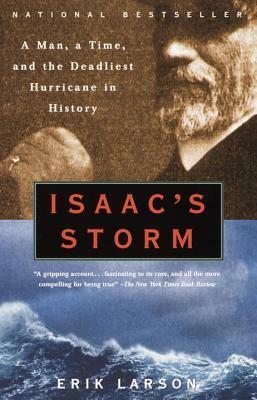 Isaac’s Storm is a historical non-fiction about the Galveston Hurricane of 1900, which struck the coastal Texas island town and claimed the lives of an estimated 8,000 people. Also part biography, Larson connects the storm to Galveston’s chief meteorologist at the time, Isaac Cline, and lays out the early developments in weather forecasting in the United States. This book attracted my attention because I had previously read Larson’s The Devil in the White City in 2011 and really enjoyed learning about a strikingly interesting element in the midst of a notably historical event. While Isaac’s Storm was written before The Devil in the White City, it is certainly still in that vein. Isaac’s Storm started off a bit slow for me, but once I reached the account of the storm it was very difficult to put down. Larson recreated the confusion, terror, and grim devastation of that fateful day with evocative, breathtaking detail. I was floored by the audacity of bureaucratic competition and communication sabotage between American and Caribbean weather departments, when it was becoming clear that storms like this were wild, dangerous, and not often so predictable. While he did seem a quite brilliant man, Isaac’s arrogance and egoism (as well as his brother Joseph’s) is mind boggling—that he would later praise himself for his actions (or at least what he told people he did) during the crisis! I couldn’t believe, after so many deaths, he didn’t seem to take much responsibility for his lackadaisical forecasts of the storm. The last few pages are staggeringly affecting—when Larson discusses how the public has pretty much forgotten that hurricanes can be profoundly fatal on a massive scale. A mere five years after this book was published, Hurricane Katrina took New Orleans. I would recommend this book if you like history, American history, science, weather phenomena, and Erik Larson’s other books. I’m definitely marking down his books that I haven’t read yet on my to-read list! Isaac’s Storm was my third read of twelve books total for the 2013 TBR Pile Challenge, hosted by Adam at Roof Beam Reader. Read from February 25 to 28, 2013. This entry was posted in books and tagged 2013 tbr pile challenge, biography, history, non-fiction, survival, weather by kristin @ my little heart melodies. Bookmark the permalink. I’m going to add this to my list, thanks for the post. I just finished The Devil in the White City, it was superb! In the Garden of Beasts was great too 🙂 I haven’t read Isaac’s Storm…yet! I have been seeing Garden of Beasts all over the place lately… looking forward to getting to that one eventually!